A True pointer and retriever. Jake is AKC and UKC registered. Successful at the highest hunt test levels. No E-COLLAR has touched this dog. 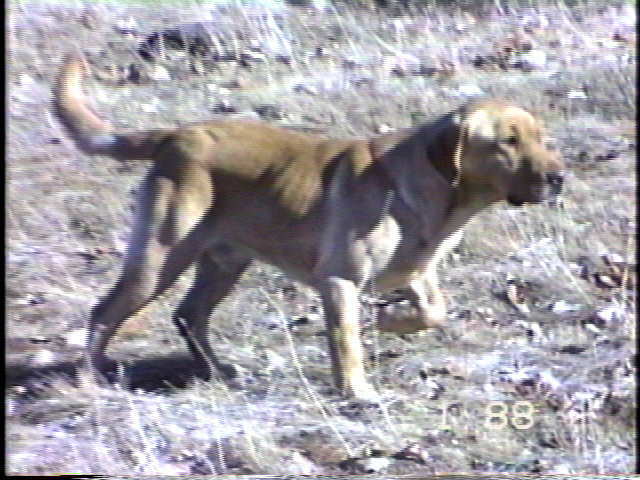 Dam CERTIFIED POINTING RETRIEVER: CPR "Joemac's Dakota Rose"
5 littermates are APLA certified Pointing Labs. I look back at the several hundred pointing labs that I have had a chance to work with from all over the country. with each passing year, I realize more and more how special Jake is. He set the standard so high that it is hard for me to accept the work of most fairly good pointing dogs. Those who get a chance to see Jake hunt and point generally experience severe jaw-drop. Jake is a beautiful dog with an amazing nose and the best pointing instinct I've ever seen in a lab... The best by a quantum leap. Second place is not even close. Each hunt, each rooster shot over one of those points, each day of work means more to me as I realize more keenly his gifts. Jake has shown us what a great lab is. He has an intense desire to hunt and retrieve,and a very strong desire to please. He is robust and intense yet easy for my children to handle. He is not a barker, holds himself with that regal air and does his work with style. His puppies are fast-learning, good looking dogs who are successful hunters, obedience dogs,family companions and even therapy dogs. Featherstorm (Jake) is a true pointing lab. His point is natural, scent-driven, intense and consistent. I have told people flying up to see jake that I will buy their plane ticket if he does not point all planted birds and if they are at all unsure of the instinct, or think that I taught him to point. That offer still stands to anyone. Jake has proven successful in upland and waterfowl hunting. His first trip to North Dakota this year included a "submarine" retrieve where Jake dissapeared underwater and brought-up a wing - shot drake that had dove. My hunting-partner almost fell out of the boat when he saw that. I of course, claimed all credit citing the many successes of my underwater training techniques. That same day in a different spot, a friend winged a drake that sailed on us. I saw it swim into grassy-cover in a shallow area of the marsh about 200 yards from the boat. Walking was easy so I took Jake over to the spot where the duck entered. He trailed that bird for over 100 yards. Through thick sedges with shallow water. There was some pride in reappearing from that grass with a lively greenhead in-hand. These are the type of feats that good labs perform. I share these stories because this was Jake's first-day of hunting ducks. He learned the game quickly and showed the drive and stamina needed to be successful in heavy cover. 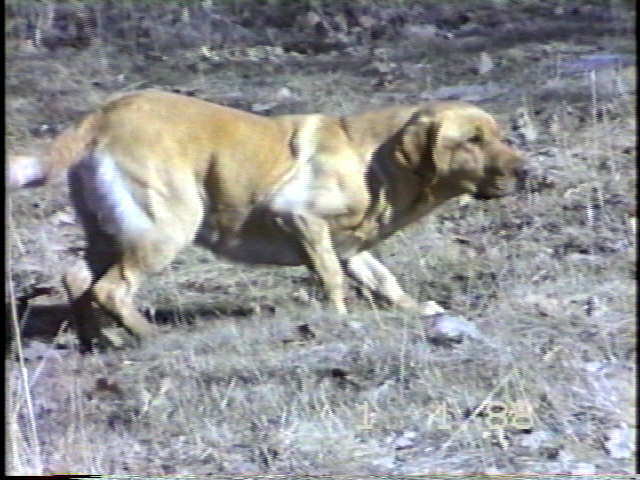 Part of his quick-success was due to training, but a lot of it was due to the excellent breeding behind this dog. In short he inherited the traits to be successful. Jake's first hunt for wild pheasants was also memorable. He and I were duck hunting the day after the pheasant opener. Jake made a nice blind retrieve on the only duck we saw in the air that morning. Hearing roosters on shore we packed-it in early and I decided to walk for pheasants. Good decision. In 20 minutes on public land the day after the opener Jake had 8 productive points. The First and last points were roosters. All others were hens. but he stuck with the game even after having to watch the hens escape unscathed. He has a real desire to find, point and retrieve birds. This dog has traits that can improve the breed. He is A Versatile hunter with strength, and drive, looks, and a VERY strong pointing-instinct. A companion who brings added joy to the hunt. and to daily walks with the kids. If you are interested in incorporating these traits into your next litter please contact us about stud-service. If you, or someone you know might be interested in a Jake- puppy... Contact us and we will direct you to a litter that seems to be a good fit for you. We love to chat about dogs so if you have any questions call anytime. We look forward to sharing your enthusiasm for labs in general, and pointing labs in particular.